Power Plant | Matcor, Inc.
Cathodic protection for underground piping, when applied properly, is an effective means to prevent corrosion. For many underground applications, such as pipelines, cathodic protection system design is relatively straightforward. Plant and facility environments, however, are not simple applications. 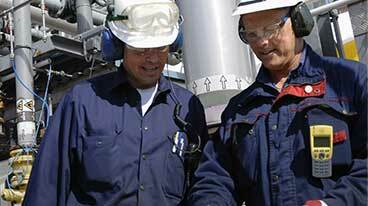 Plants have congested underground piping systems in a tightly spaced footprint. The presence of copper grounding systems, foundations with reinforcing steel embedded in concrete, conduit, utility piping and structural pilings (either bare or concrete with reinforcing steel) can greatly complicate the task of designing a pipe cathodic protection system. For simple plant facilities, it is possible to isolate the piping and utilize a conventional galvanic corrosion prevention system. This works only if the plant piping is electrically isolated from other underground structures for the life of the facility. For most plant and facility applications, it is not practical to isolate the piping from the grounding system for the life of the facility. In these cases an impressed current anode system is the only alternative. 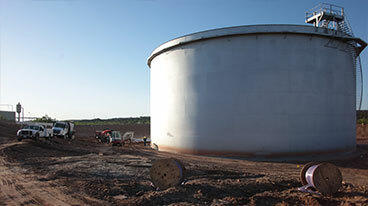 There are three basic approaches to cathodically protect underground piping and structures using impressed current anodes. One method is the deep anode in which high current capacity anodes are installed from the structure in a deep hole drilled vertically 150+ feet deep. This is analogous to lighting a football field with floodlights. Another method is to use a shallow ground bed anode design where many smaller capacity ground bed anodes are spaced near the intended structures – analogous to street lamps lighting a street. The third method is to place a linear anode parallel to and in close proximity to the piping to be protected discharging current continuously along its length – similar to fiber optic lighting. This technical bulletin details the advantages of using the linear anode approach for new plant construction projects to protect buried piping in a congested environment. This approach provides the most effective solution both technically and commercially. Electrical isolation is a major concern when designing a CP system for any plant or facility application. Isolating a single cross country pipeline segment from point A to point B is achieved rather simply through the use of electrical isolation flanges/isolation joints that the pipeline operator maintains and tests regularly. The realities of power plant piping networks, on the other hand, significantly complicate electrical isolation. By code, everything above grade in a plant must be grounded, yet it is common to see pipe cathodic protection systems designed based on isolation of the buried piping. Even if electrical isolation is achieved during the plant construction, maintaining electrical isolation over the life of the facility may not be realistic. Given the speed and complexity with which new plants are erected, achieving electrical isolation during construction is no simple task. Once installed, electrical isolation flange kits require regular monitoring and periodic replacement that often does not occur. Piping modifications and other plant maintenance activities can also result in an inadvertent loss of electrical isolation. Cathodic protection for underground piping that relies on electrical isolation should be avoided for plant applications. Another critical issue that must be properly considered during the design of a CP system for plant applications is the highly congested underground environment and the challenges of achieving thorough current distribution. 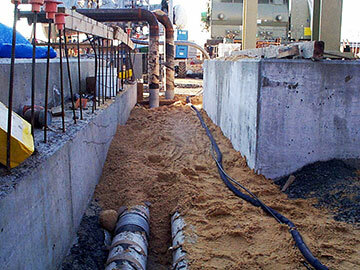 Buried piping is often located in congested underground areas in close proximity to grounding systems, foundations with reinforcing steel, pilings systems, metallic duct banks and other structures that can shield current from the piping systems that are the intended target of plant cathodic protection systems. It is virtually impossible to assess where current will go in a plant environment – the more remote the anode source, the more difficult it is to assure appropriate current distribution. When discussing current distribution, it is also important to discuss the potential for stray current. For grounded systems, current that is picked up by other buried metallic structures is merely current that is wasted and not available to protect the intended buried piping structures. For isolated metallic structures, such as foreign pipelines, ductile iron piping systems, and nearby facilities or structures, stray current may be a significant concern. Stray current problems occur when current is picked up on an isolated structure and later discharges off that structure and back to a grounded structure. At the location where stray currents discharge, rapid corrosion may be inadvertently induced on the isolated structure. Does not require electrical isolation. Because the linear anode is closely located next to the piping being protected, electrical isolation is not a significant concern. The anode is “closely coupled” to the piping and operates with a very low anode gradient that minimizes any losses to nearby structures including grounding. Assures good current distribution as the anode runs parallel to the piping being protected. The linear anode cathodic protection system design eliminates any requirement for supplemental anodes to address areas where remote anodes may be shielded after the CP system is commissioned. Wherever the piping goes, the linear anode follows in the same trench. This also makes it very easy to adapt the design during piping revisions that may change the piping system routing as the plant construction proceeds. Eliminates risks of stray current. Close proximity to the piping being protected significantly limits current losses to other structures and virtually eliminates shielding and stray current concerns. This also significantly reduces the total current requirements for the system, reducing the rectifier requirements. Access issues – the linear anode is installed in very close proximity to the piping that is to be protected. 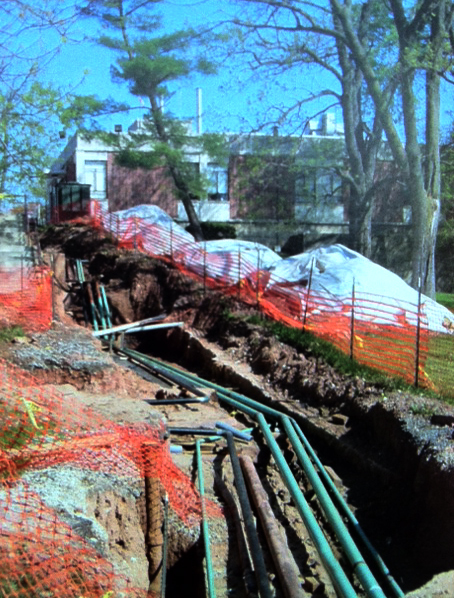 This minimizes the risk of third party damage and reduces trenching required for buried cable. If installed in conjunction with the piping, the anode can be placed in the same trench as the piping affording the anode protection by the piping itself from external damage. This is a very cost effective cathodic protection installation when installed concurrently with the piping. Ease of installation – when installed alongside the piping as the piping is being installed, the installation is simply a matter of laying the anode cable in the trench. Our experts are happy to answer your questions about cathodic protection for underground piping. British Columbia is on the verge of a natural gas development boom that will rival anything Alberta has experienced, according to B.C.’s Community Minister. Bill Bennett made that comparison Tuesday while speaking at a press conference to announce the final regulatory pieces have fallen in place for a new liquefied natural gas plant to be built on a native reserve near Kitimat. The massive LNG plant, a joint venture by Apache Canada Ltd. and Chevron Canada Ltd., in co-operation with the Haisla First Nation, will process nearly 700 million cubic feet of gas per day, becoming a key link in the transportation chain between B.C.’ s northeast gas fields and off-shore markets. Mr. Bennett said the plant, the first of six that have been proposed for the West Coast, will open up B.C.’s massive gas fields and allow the resource industry to thrive like it never has before in the province. “The story here is a story about British Columbia exploiting an opportunity … on the scale of what faced Alberta 40 to 50 years ago,” Mr. Bennett said. “The opportunity for B.C. really is on the same scale as for example, Norway, when they discovered they had off-shore oil [and gas discoveries] and Alberta when they discovered they had oil and could ship it to the U.S.,” Mr. Bennett said. He said both Alberta and Norway have thrived economically because of the way their governments regulated and encouraged the development of rich oil and gas resources. “It’s built [Alberta’s] economy and made them, you know, the most [economically] comfortable province in Confederation. “It’s that scale of an opportunity [for B.C. ],” he said. Last month Apache Canada and Chevron Canada announced they were teaming up to develop gas fields in the Horn River and Liard basins, in northeast B.C. At a press conference in Vancouver, Mr. Bennett and John Duncan, federal Minister of Aboriginal Affairs and Northern Development, jointly announced regulatory changes that they said have now cleared the way for construction of the Kitimat LNG plant. Haisla Chief Councillor Ellis Ross praised both levels of government and industry for working with the band to bring the project forward. “Our people have been looking at natural gas projects since the 1980s … this is a small example of what can be done if all … four parties are focused,” he said. Mr. Bennett said the regulatory changes allow the province to enforce provincial environmental standards on reserve lands, which are technically under the jurisdiction of the federal government. Tim Wall, president of Apache Canada, said the change provides “regulatory certainty” for the Kitimat LNG plant, allowing construction to proceed. “It’s unusual to be here celebrating regulations,” said Mr. Bennett, who has a reputation for battling red tape. Mr. Bennett, whose government is trailing in the polls as it seeks re-election in May, said developing B.C.’s gas fields is of “profound” economic importance to the province. “It’s huge and it has the potential to change the frame for British Columbia in terms of the jobs [created],” he said. Mr. Bennett said the chronic unemployment problems that burden many small northern communities, particularly native communities, could be relieved by the development of B.C.’s gas fields. Arkema is a world class producer of industrial chemicals, but its King of Prussia, PA Research and Development facility looks more like a college campus building than your typical industrial facility. And yet, like any industrial facility, the site has buried utility piping that is subject to external corrosion. When the facility experienced steam piping failures, they called in MATCOR to evaluate their corrosion risk and make suitable recommendations to prevent future leaks. After a preliminary engineering investigation, MATCOR recommended installing our SPL-FBR linear anode. The linear anode was ideally suited for this application because of limited site accessibility, the presence of nearby grounding, poor piping isolation, the mix of coated piping with bare steam piping, and the need for uniform current distribution along the high temperature bare steam piping. The linear anode was installed in stages as Arkema had to excavate the steam piping in multiple locations for inspection and repairs. MATCOR’s SPL–Anode is an ideal solution for many plant environment retrofit applications. When placed parallel to plant piping, the SPL Anode can be installed with minimal excavation while assuring even current distribution along the entire piping route. Unlike many point anode ground bed systems, the linear anode operates at relatively low current densities and is placed in close proximity to the piping to be protected. This reduces potential losses to nearby grounding systems and eliminates the need for isolation of plant piping. This make the linear anode a great solution for many plant piping applications such as compressor stations, power plants, petrochemical facilities, and even campus facilities such as the Arkema’s King of Prussia R&D facility. Ohio pollution controls are showing wear after as little as a year. Coal-fired power plants across the country are being checked for corrosion problems on billions of dollars’ worth of equipment that is supposed to cut air pollution. And the results from three power companies in Ohio show that the scrubbers are corroding at a much faster rate than was expected. Coal scrubbers – some 15 stories tall — spray a slurry of water and limestone into coal flumes to capture most of the pollutants before they’re released into the air. The scrubbers cost up to $500 million, and are supposed to last 25 years. But Akron-based FirstEnergy discovered corrosion in three new scrubbers at its plant along the Ohio River. None of is older than a year. American Electric Power also found corrosion at four plants in Ohio and West Virginia. And Duke Energy found it at its Southwest Ohio plant. A national inquiry is now underway by The Electric Power Research Institute. John Shingledecker is the senior project manager for the institute. He says he’s seen corrosion in as little as 11 months, and in wide variety of scrubbers. “There was some initial thought that there was only one particular alloy that was being affected,” he said. Shingledecker says figuring out the cause of the corrosion could take two years, and in the meantime coal-fired power plants can use protective coatings or clay tiles to try to stop the corrosion. But American Electric Power spokesman Pat Hemlepp says his company’s scrubbers are operating safely. Hemlepp says the cost of maintaining the scrubbers has already been calculated into customer bills. The Columbus Dispatch reported this week that AEP negotiated a confidential settlement with, a contractor on the scrubbers to address corrosion at its central Ohio plants. BRACEVILLE, Ill. (AP) – Radioactive tritium has leaked from three-quarters of U.S. commercial nuclear power sites, often into groundwater from corroded, buried piping, an Associated Press investigation shows. The number and severity of the leaks has been escalating, even as federal regulators extend the licenses of more and more reactors across the nation. Tritium, which is a radioactive form of hydrogen, has leaked from at least 48 of 65 sites, according to U.S. Nuclear Regulatory Commission records reviewed as part of the AP’s yearlong examination of safety issues at aging nuclear power plants. Leaks from at least 37 of those facilities contained concentrations exceeding the federal drinking water standard – sometimes at hundreds of times the limit. While most leaks have been found within plant boundaries, some have migrated offsite. But none is known to have reached public water supplies. At three sites – two in Illinois and one in Minnesota – leaks have contaminated drinking wells of nearby homes, the records show, but not at levels violating the drinking water standard. At a fourth site, in New Jersey, tritium has leaked into an aquifer and a discharge canal feeding picturesque Barnegat Bay off the Atlantic Ocean. Any exposure to radioactivity, no matter how slight, boosts cancer risk, according to the National Academy of Sciences. Federal regulators set a limit for how much tritium is allowed in drinking water, where this contaminant poses its main health risk. The U.S. Environmental Protection Agency says tritium should measure no more than 20,000 picocuries per liter in drinking water. The agency estimates seven of 200,000 people who drink such water for decades would develop cancer. The tritium leaks also have spurred doubts among independent engineers about the reliability of emergency safety systems at the 104 nuclear reactors situated on the 65 sites. That’s partly because some of the leaky underground pipes carry water meant to cool a reactor in an emergency shutdown and to prevent a meltdown. Fast moving, tritium can indicate the presence of more powerful radioactive isotopes, like cesium-137 and strontium-90. One of the highest known tritium readings was discovered in 2002 at the Salem nuclear plant in Lower Alloways Creek Township, N.J. Tritium leaks from the spent fuel pool contaminated groundwater under the facility – located on an island in Delaware Bay – at a concentration of 15 million picocuries per liter. That’s 750 times the EPA drinking water limit. According to NRC records, the tritium readings last year still exceeded EPA drinking water standards. And tritium found separately in an onsite storm drain system measured 1 million picocuries per liter in April 2010. Also last year, the operator, PSEG Nuclear, discovered 680 feet of corroded, buried pipe that is supposed to carry cooling water to Salem Unit 1 in an accident, according to an NRC report. Some had worn down to a quarter of its minimum required thickness, though no leaks were found. The piping was dug up and replaced. The operator had not visually inspected the piping – the surest way to find corrosion- since the reactor went on line in 1977, according to the NRC. PSEG Nuclear was found to be in violation of NRC rules because it hadn’t even tested the piping since 1988. Last year, the Vermont Senate was so troubled by tritium leaks as high as 2.5 million picocuries per liter at the Vermont Yankee reactor in southern Vermont (125 times the EPA drinking-water standard) that it voted to block relicensing – a power that the Legislature holds in that state. In March, the NRC granted the plant a 20-year license extension, despite the state opposition. Weeks ago, operator Entergy sued Vermont in federal court, challenging its authority to force the plant to close. At 41-year-old Oyster Creek in southern New Jersey, the country’s oldest operating reactor, the latest tritium troubles started in April 2009, a week after it was relicensed for 20 more years. That’s when plant workers discovered tritium by chance in about 3,000 gallons of water that had leaked into a concrete vault housing electrical lines. Since then, workers have found leaking tritium three more times at concentrations up to 10.8 million picocuries per liter – 540 times the EPA’s drinking water limit – according to the New Jersey Department of Environmental Protection. None has been directly measured in drinking water, but it has been found in an aquifer and in a canal discharging into nearby Barnegat Bay, a popular spot for swimming, boating and fishing.